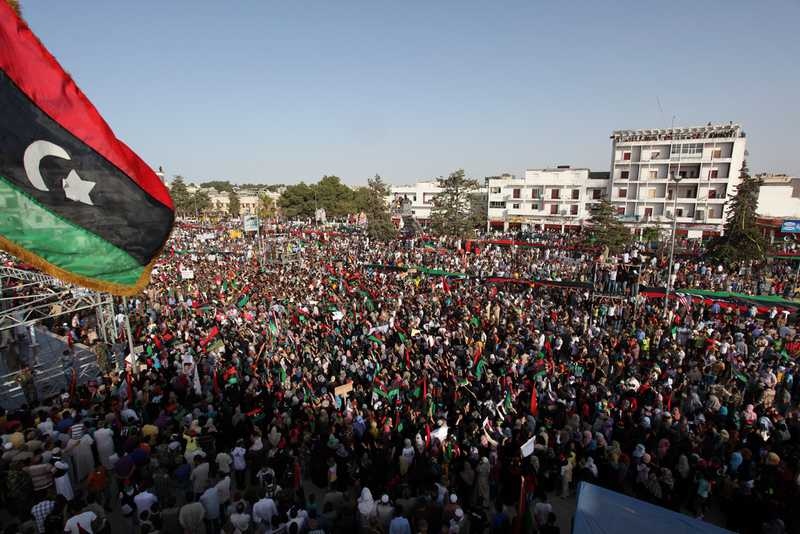 Demonstrations in Bayda, Libya during the 2011 Revolution. Dr. Alia Brahimi is an academic, analyst and commentator specialising in the politics of the Middle East. She is currently a Visiting Research Fellow at the Oxford University Changing Character of War Programme at Pembroke College and a PS21 Global Fellow. ‘We have an appointment with Rome, God willing’, reads one Twitter entry for the Islamic State (IS) hashtag #Immigration to the State in Libya. Located 400 miles from the southern shores of Europe, Libya unfortunately recommends itself as the next staging ground for a major IS advance. Since the ouster of Mu’ammar al-Qadhafi in 2011, Libya has served as an operating space for tens of thousands of jihadists pushed out of Mali, Algeria, Egypt and Tunisia, including notorious al-Qaeda veterans such as Mokhtar Belmokhtar and Ibrahim Ali Abu Bakr Tantoush. Hardline Salafis have won control of major population centres, in Derna and parts of Benghazi and Sirte. Libya also boasts porous borders, significant oil resources, and up to 28 million weapons circulating among a population of 6 million. Furthermore, as one former Libyan Prime Minister noted in April 2014, ‘there is no state in Libya to say if it is a failed state or not’. After 2011, a fragile central government, headed by five Prime Ministers in three years, struggled to exercise authority, particularly in the absence of a national army. As anti-Qadhafi militias refused to disarm, the parliament was stormed, political assassinations and kidnappings were routinized, the police and judiciary were too fearful to operate, and most foreign nationals were evacuated. Then, after elections in June 2014, two rival alliance blocs each claimed the mantle of Libya’s legitimate government. The interim parliament and the internationally-recognised government of prime minister Abdullah al-Thinni are now based in the eastern city of Tobruk. They are militarily backed by federalist militias, armed groups from Zintan, and General Khalifa Haftar, a strongman who defected from the Qadhafi regime in the 1980s. The ‘Libya Dawn’ coalition is based in Tripoli and comprises a motley crew of Muslim Brotherhood supporters, jihadists and more economically-motivated militiamen from Misrata, Zawiya and Sabratha. Foreign military support – from Egypt and the UAE for the Tobruk government, and from Turkey and Sudan for the Tripoli bloc – has served to deepen this political fracture. In between these two poles, Abu Bakr al-Baghdadi has seen the opportunity to commandeer and organise the well-established jihadist presence in Libya. For indeed, the IS leadership does not merely seek to exploit chaos, but also, through the creation of proto-states, to impose a long-term order. 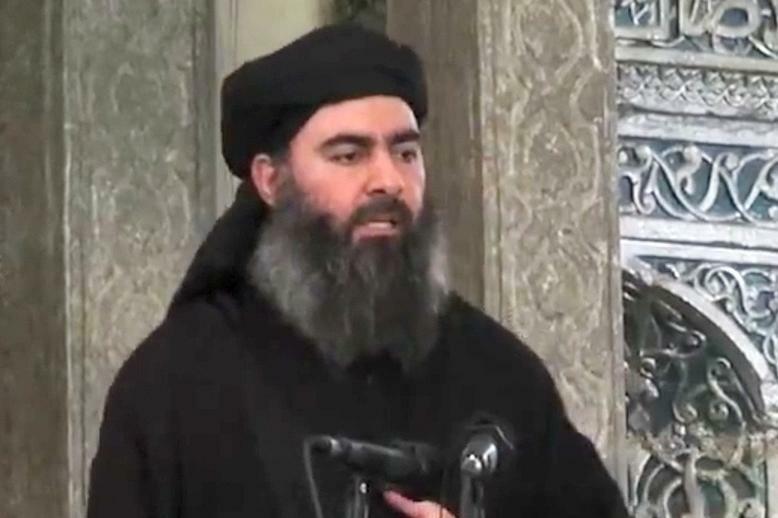 Abu Bakr al-Baghdadi, leader of the Islamic State (ad-Dawla al-Islamiyya). Towards the end of last summer, Baghdadi dispatched one of his senior aides, Abu Nabil al-Anbari, to prepare the ground in Libya. The star IS preacher, Turki al-Binali (stripped of his Bahraini citizenship in January) was twice spotted sermonising in the former Qadhafi stronghold of Sirte. Within weeks, official IS provinces were announced in the east of Libya (Wilayat Barqa), the west (Wilayat Tripoli) and the south (Wilayat Fezzan). Since January, IS has stepped up its operations, including the siege of a luxury hotel in Tripoli, the beheading of 21 Egyptian Coptic Christians, attacks on oil fields near Sirte, and car bombings in Qubbah, Benghazi and Misrata. IS has engaged in fierce fighting with both the Tobruk and Tripoli alliances. However, while the establishment of IS in Libya is an effect of Libya’s fragmentation, it will also become a cause. To begin with, the IS presence promises to further disrupt the already fracturous alliance of Libya Dawn. Fighters allied to Libya Dawn have violently clashed with IS – as around Sirte where the notorious Tunisian Ahmed Rouissi was killed fighting for IS – a development which will lead to the defection of hardliners sympathetic to Baghdadi’s agenda. The IS presence will also place significant pressure on the Tobruk alliance, elements of which may reject the on going negotiations for a unity government with Libya Dawn, in order to try to purge the country of militant Islamism once and for all. Most significantly, however, IS will send into turmoil an already splintering jihadist scene in North Africa. The rivalry between al-Qaeda and IS is well known, and al-Qaeda’s regional allies are sure to begrudge Baghdadi’s bold play for their stomping ground in Libya. For one, the leader of Al-Qaeda in the Islamic Maghreb, Abdelmalek Droukdel, allegedly vowed to ‘liquidate’ IS. These ‘turf’ wars map onto larger battles concerning the ideology and strategy of global jihad. In the manner of Osama bin Laden and Ayman al-Zawahiri, Droukdel rejects wanton killing, advocates a pragmatic approach to dealing with local cultures and Islamic sects, and counsels against (relative) extremism. ‘At this stage you should avoid issues of takfir’, he once ordered his fighters in Mali, referring to the practice of pronouncing that someone is no longer Muslim. ‘You should limit the circle of confrontation and of your enemies to the utmost’. Incidentally, some commentators suggested that the recent pledge of allegiance by Boko Haram to Baghdadi represented a significant blow to AQIM’s regional influence. However, Droukdel never sought an alliance with the likes of Boko Haram, committed as he was to, firstly, attacking western targets and, secondly, conducting jihad according to certain standards of behaviour. But like Boko Haram, the Islamic State has relentlessly targeted what I term the ‘nearer enemy’: impure elements of local society. In Iraq and Syria, Baghdadi identified the Shi’a as the primary enemy, launched a ruthless campaign against religious minorities, and brutally suppressed dissent to his puritanical vision of Sunni Islam. Indeed, while the announcement of a caliphate would, in itself, imply a strong element of politico-religious unity, the real story is one of discord and intensifying division. In its heartlands, IS has waged war on other hardline Sunni groups within the Syrian and Iraqi opposition, including Jabhat al-Nusra and Jama’at Ansar al-Islam, and conducted a campaign of executions against the Sunni tribes of Iraq’s Anbar Province, particularly the Albu Nimr. 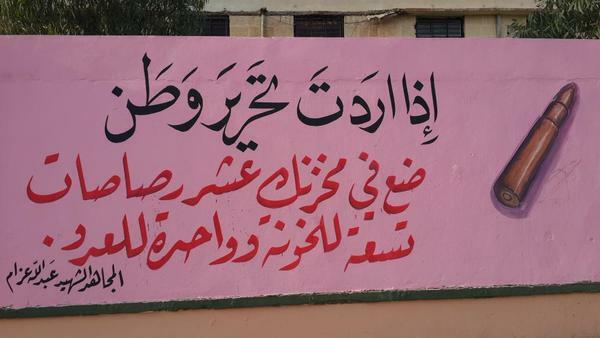 One IS mural in Tel Afar bears a quote from the jihadist ideologue, Abdullah Azzam: ‘if you want to liberate a land, place in your gun ten bullets. Nine for the traitors and one for enemy.’ Accordingly, IS has established an ‘Islamic Military Police’ unit in Raqqa, to deal with dissenting fighters and deserters within its own ranks. After the horrific killing of Jordanian pilot Mouath al-Kaseasbeh, reports emerged of the arrest in Aleppo of a Saudi cleric who had voiced his objections. IS has also executed hundreds of its own, including its spiritual leader in Deir Ezzour, Abu Abdullah al-Kuwaiti, the chief of security in Aleppo, Abu Obeida al-Maghrebi, and dozens of foreign fighters who allegedly plotted a coup. Baghdadi’s project is predicated on a theoretically endless process of cleavage and excommunication. Because IS has made inroads in Libya (and also Egypt and Yemen) by co-opting or infiltrating pre-existing (local) groups, schisms there will be even more prolific than in its native territories in Iraq and Syria. As I argue in a forthcoming article for the International Institute for Strategic Studies, the coming phase of global jihadism will be driven by a dialectical tension between unity and fragmentation. The IS paradigm of jihad guarantees division. IS and its predecessor groups in Iraq approached jihadism as a state-building enterprise, driven primarily by their participation in the post-2003 insurgency and tactical alliances with former Ba’athist officials. However, inhering in this territorial model of jihad are two major sources of potential conflict. Firstly, it affords to IS ‘provinces’ access to sources of income which are independent from the central leadership, and based upon local taxation, extortion and extraction. Secondly, and consequently, competing clans within these provinces will seek to capture the ‘state’. However, though rivalries may eventually consume IS from the inside out, in the more immediate term the global jihad will be energised by competition between its various components. For example, both the In Amenas and Westgate attacks were the outcome of tugs of war within the perpetrating organisations (AQIM and al-Shabaab). In short, through rivalry, there has been an element of revival. If the political status quo in Libya persists, and because assorted factions will aggressively vie for the limelight, we can expect a lift for jihadism in North Africa and beyond. Project for Study of the 21st Century is a non-national, non-partisan, non-ideological organization. All views expressed are the author’s own.